The role of the Fairweather is to conduct hydrographic surveys in order to acquire data to be used in navigational charts. While the Fairweather has sonar equipment and collects lots of data in transit, much of the data collected on a daily basis is by using smaller boats, with a rotating crew of 3-4 people per boat. The Fairweather will sail to the research area and drop anchor, and for multiple days crews will use these smaller vessels to collect the raw data in an area. “Sonar” was originally an acronym for Sound Navigation and Ranging, but it has become a word in modern terminology. 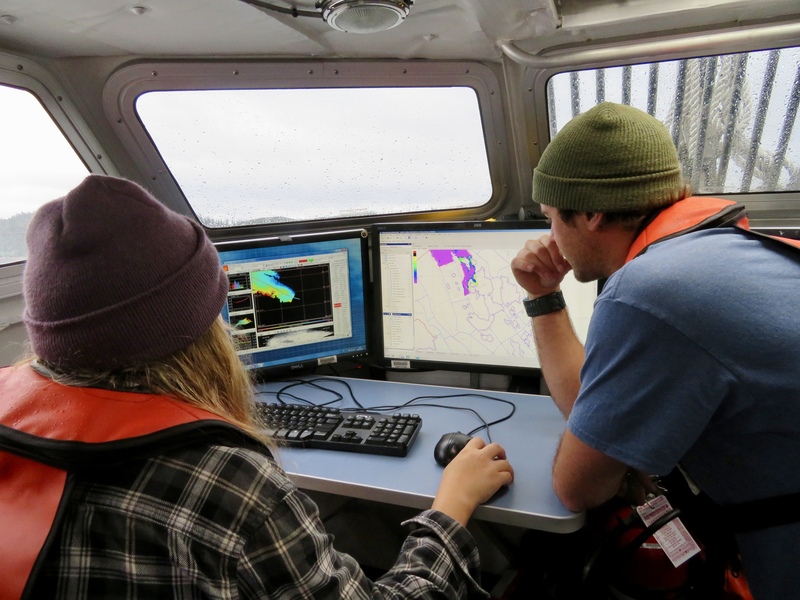 The boats contain active sonar devices used by the NOAA scientists to calculate water depth, document the rocks, wrecks and kelp forests, and in general, determine hazards to boats. Ultimately their data will be converted in to navigational charts – but there is a significant amount of work and stages to be undertaken to make this a reality. 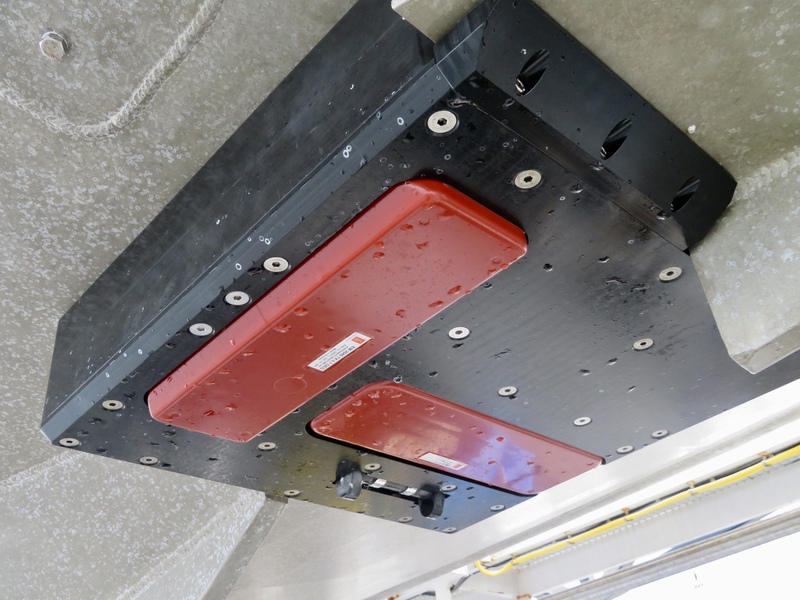 Attached to the small boats are Kongsberg Multi Beam Echo Sounders (MBES). These devices emit sound waves in to the water. The waves fan out and reflect off the bottom of the sea floor and return to the MBES. Based on the time it takes for the MBES to send and receive the sound waves, the depth of the sea floor can be calculated. 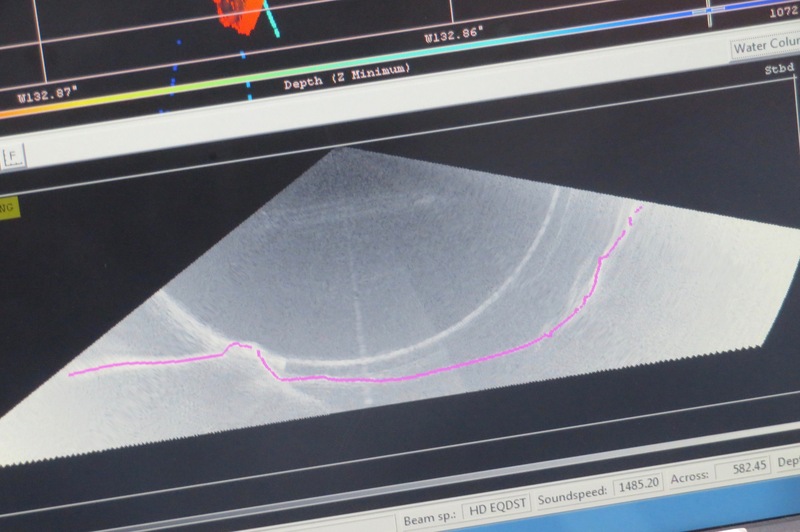 As the boat moves through the water, thousands of pieces of data are collected, and collectively a picture of the sea floor can be built. It sounds simple, right? But I am beginning to understand more about the complexities that go in to a project of this scope. It would seem simple perhaps, to drive a boat around, operate the MBES and collect data. As I have quickly come to understand, there is a lot more to it. As mentioned before, due to the weather conditions in the geographic area of study and routine maintenance, the Fairweather has a field season, and a dry dock season. During the non-field season time, data is analyzed from the previous seasons, and priorities and plans are made for the upcoming seasons. Areas are analyzed and decisions made as to which regions the Fairweather will go to and sheets are determined. A sheet is a region within the project area. Each sheet is broken up in to polygons. On any given day, one small boat will cover 1-3 polygons, depending on the weather, the complexity of the area, and the distance of travel from the Fairweather. There are many parameters that the scientists need to consider and reconfigure to acquire and maintain accurate data collection. A minimum density of soundings (or ‘pings’) is required to make sure that the data is sufficient. For example, in shallow waters, the data density needs to be a minimum of five soundings per one square meter. At a greater depth, the area covered by the five soundings can be 4 square meters. This is due to the fact that the waves will spread out more the further they travel. A coxswain will drive the boat in lines, called track lines, through the polygon. As the data is collected the ‘white chart’ they are working with begins to get colored in. Purple indicates deepest water. Green and yellow mean it’s getting less deep. Red indicates shallow areas, and black needs to be avoided. 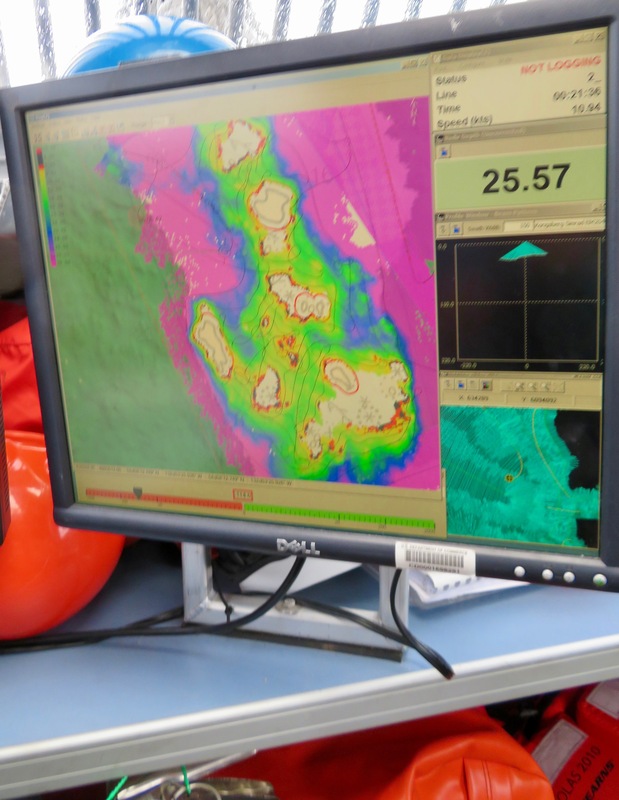 In the pictures below you can begin to see the data being logged visually on the map as the boat travels. Make an analogy to mowing a lawn. There are areas of most lawns where it is easy to push the lawnmower in straight lines, more or less. The same can be said for here, to some extent. 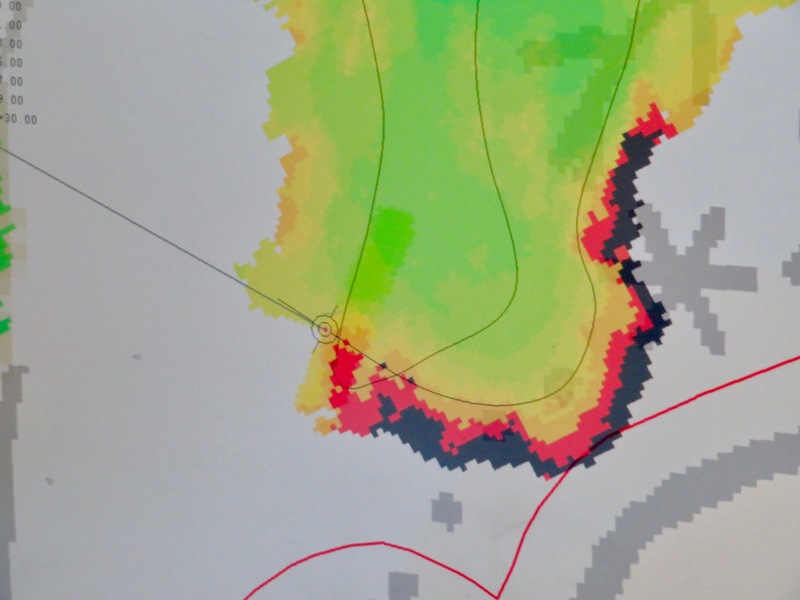 In the deeper waters, not close to shore, the boats can ‘color in’ their polygon using relatively wide swaths that allow the sonar data to overlap just slightly. Every time the boat turns to go back in the opposite direction, the MBES is paused, and then started again once the boat is in position, making a new track line. Close to the shore, referred to as near shore, there are usually more hazards. In these areas, speed is slowed. Due to the increased potential of rocks and kelp beds in an unknown area, the boats do something called half-stepping, in-effect overlapping the ‘rows’ – think about re-mowing part of that section of lawn, or mowing around tree trunks and flower beds. As a visual image comes up on the screen, the coxswain and the hydrographers can determine more where their next line will be and whether they should continue surveying that area, or if there are too many hazards. Full coverage needs to be achieved as much as possible. At times this does not happen. This can be as the result of several factors. 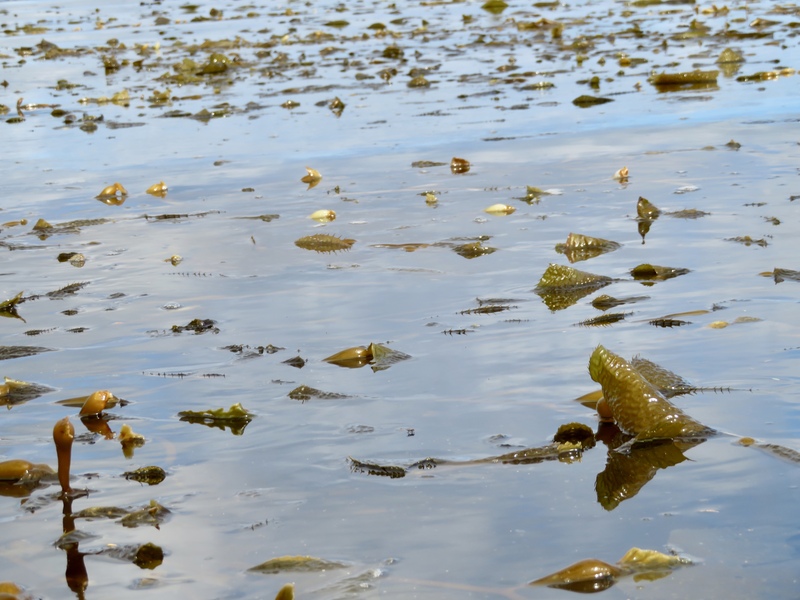 Kelp increases the complexity of data collection. Kelp often attaches to rocks, and there are large ‘forests’ of kelp in the areas being surveyed. As the sonar also ‘reads’ the kelp, it’s not possible to know the true location, size and depth of the rock the kelp is attached to, and in some instances, to determine if the kelp is free floating. Steep slopes, rocks and kelp can also create ‘shadows’ for the MBES. This means that there are areas that no sounding reached. If possible the survey team will re-run a section or approach it from another angle to cover this shadow. At times, the rocky areas close to shoreline do not allow for this to be done safely. A holiday is a term used by the survey crew to describe an area where data did not register or was missed within a polygon or sheet. During data collection, a day may be dedicated for boats to return to these specific areas and see if the data can be collected. On occasion, weather conditions may have prevented the original crew from collecting the data in the first place. Equipment malfunction could have played a role, as could kelp beds or hazardous rock conditions. Survey crews are given several tools to help them navigate the area. Previous nautical charts are also superimposed on to the electronic chart that the surveyors are using. While many of these contain data that is out of date, it gives the crew a sense of what hazards in the area there may be. Symbols representing rocks and kelp for example are shown. The Navigable Area Limit Lines (NALL) are represented by a red line that can be superimposed on the map. Any area closer to shore than the NALL is not required to be surveyed. The red line is the Navigable Area Limit Line. Areas inland of this line do not need to be surveyed, as they are known to be entirely non-navigable. On occasion, surveying will discover a Danger to Navigation (DTON). This might include a rock close to the surface in a deeper water area that is not shown on any map and which may pose imminent danger to mariners. In these instances these dangers are reported upon return to the Fairweather, and information is quickly sent to the Marine Chart Division’s Nautical Data Branch. During the course of the day, the scientists are constantly checking the data against a series of parameters than can affect its accuracy. Some of these parameters include temperature, salinity of the water and the tide levels. More about these parameters will be discussed in later blog postings. The first part of the day involves the stewards getting coolers of food ready for the survey crew who will be gone all day. The engineers have fixed any boat issues from the previous day and re-fueled the boats and the deck crew have them ready to re-launch. A GAR score is calculated by the coxswain and the crew, to determine the level of risk for the days launch. 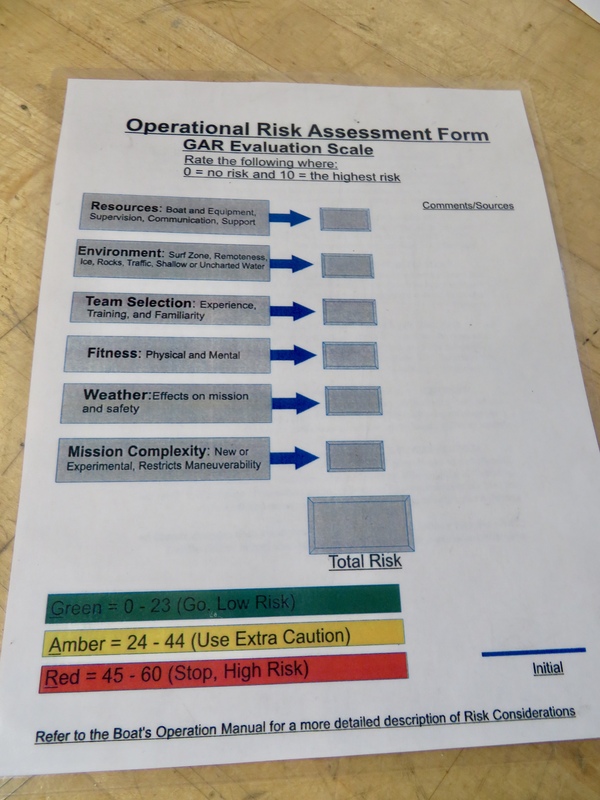 The GAR score examines the resources, environment, the team selection, their fitness, the weather and the mission complexity. Each factor is given a score out of 10. Added up, if the total is 23 or less, the mission is determined ‘low risk’, 24-44 is ‘use extra caution’, and greater than 45 is high risk. On the first day I went on a boat, as a first timer, the GAR score was a couple of points higher in the ‘team selection’ section as I was new. Another fascinating aspect of this research is the equipment on the ship needed to launch these small boats. Huge winches are needed to hoist the boats in and out of the water. Deck crew, with support from the survey crew are responsible for the boat hauling multiple times a day, and the engineers are on hand to fix and monitor the equipment. After my first day out on the small boats, the data acquisition began not only to make more sense, but also my understanding of the complex factors that make the data collection feasible began to broaden. I had naively assumed that all the work was done from the Fairweather and that the Fairweather would be constantly on the move, rather than being anchored in one location or so for a few days. As we journeyed around small islands covered in Sitka spruce, I watched constant communication between the survey crew and the coxswain on the small boats. The survey crew are constantly monitoring the chart and zooming in and out so that the coxswain can get a better and safer picture of where to take the boat. As well as watching the monitors and driving the boat, the coxswain is also looking ahead and around for hazards. There is a significant number of large floating logs ready to damage boats, and on occasion, whales that the boat needs to stay away from. It is a long day for all the crew. Bekah and Sam monitor the incoming data to communicate quickly with Nick, the coxswain. Aside from learning about the data acquisition being on the small boat, one of the joys was to be closer to some of the wildlife. While I will go in to more detail in later entries, highlights included catching glimpses of humpback whales, families of sea otters, and harbor seal pups. Yes, I got to drive…in the purple area. While animals, such as bats, have been using sonar for thousands or millions of years, it wasn’t until the sinking of the Titanic that sonar devices were invented and used for the locating of icebergs. During World War I, a French physicist, Paul Langévin, developed a tool to be able to listen for submarines. Further developments lead to sonar being able to send and receive signals. Since then, major developments in sonar technology have led to many different applications in different science fields. On small boat surveys, nadir is the term used to describe the ocean floor directly below the boat. It is the low point below the boat. 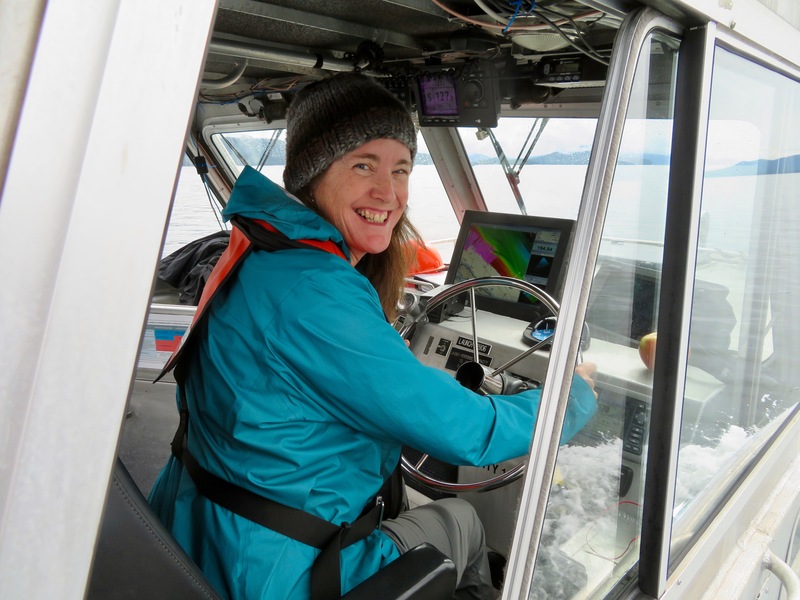 This entry was posted in 2017, Helen Haskell, NOAA Teacher at Sea and tagged data collection, kelp, navigation, NOAA Ship Fairweather, polygon, sheet, survey launch. Bookmark the permalink. Hope you are having fun and it looks like you are learning a ton!